ICAI organized CA IPCC November 2017 examination. The IPCC ITSM question paper has also now available to download here. All IPCC students can download this Information Technology and Strategic Management Question Paper Nov 2017. Below, you can start download IPCC Information Technology and Strategic Management Question Paper November 2017. CA IPCC Information Technology and Strategic Management ITSM Question Paper Nov 2017 download PDF link which shared here down. We already uploaded here IPCC All Subjects Question Papers Nov 2017 to download it. You can find it on our website plus subscribe your email address to receive free CA updates. 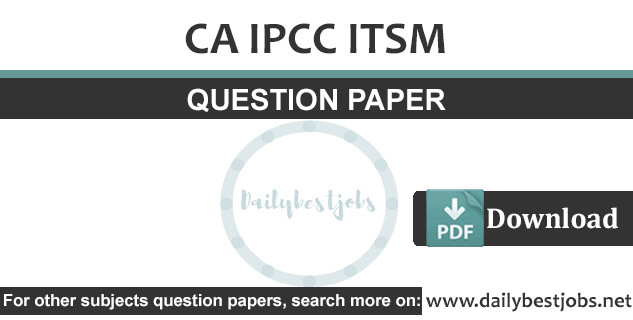 Download the below PDF of CA IPCC ITSM November Question Paper 2017. We expect to have this PDF file free download IPCC ITSM Question Paper November 2017. You can also download here other CA IPCC, CA Final or CA CPT related free PDF resources i.e. ICAI Practice Manual (PM's), CA Answer Sheet/Certified Copies, Final IPCC Question papers & CA Theory Notes.